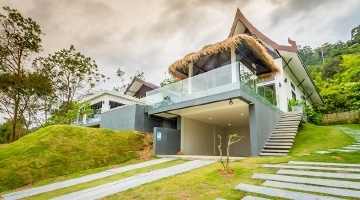 Property for sale in Ko Lanta, Thailand. Properties Ko Lanta. Koh Lanta, the tropical island paradise that has something for everyone - from young families to party goers. Lanta has everything you could need to enjoy your perfect holiday from exciting tours and activities, the best in beach going and top notch amenities and experiences to keep you wanting more. Dive world class sites, ride elephants, visit deserted “castaway” islands, learn to cook authentic Thai cuisine -the list of activities to try is long, however we hope your stay is too. If this sounds a little too adventurous for you - just kick back, relax and wait for your daily fix of the beauty that a famous Lanta sunset can offer. Best enjoyed with a cold beer and maybe a barbecued fish- and if you find your second wind later on, a beach party is never too far away. This is definitely still Thailand, offering the best in Thai cuisine and warm Thai hospitality with that wonderful tropical twist making Koh Lanta famous for its laid back way of life. Koh Lanta is a an island of diverse cultures and great people offering a local Thai mix of Muslims, Sea Gypsies and Chinese along side its many cosmopolitan visitors. Koh Lanta´s excellent and pristine beaches have won numerous international travel awards for their soft sand and the crystal clear and warm waters of the Andaman Sea. There are eleven excellent beaches to be found on Lanta´s West coast, getting more quiet and secluded the further South you travel. So go find your favourite! If you want to experience more authentic local culture, take a motorbike across the Island to the East Coast. Visit Lanta's Old Town and spend some time soaking up the atmosphere of a 100 year old fishing village. Koh Lanta is a National Marine Park including 52 exotic islands to explore- some inhabited, some not! All are stunning and if you can tear yourself away from your beach of choice- go find another one!